I read with interest the recent news reports of the death of Ralph H Baer, the German-born electronics engineer who is credited with inventing the first video game console in 1966. Baer, who died aged 92 on 6 December, pioneered the concept of a unit which would allow two people to play a selection of simple interactive video games using a domestic television set as the display device. He and two colleagues developed a prototype unit which incorporated two controllers, each with two input dials and a pushbutton, and a bank of switches for selecting which game to play from a choice of 12. This was subsequently licensed to US consumer electronics firm Magnavox and introduced as the Magnavox Odyssey in August 1972. The success of the Odyssey prompted other companies such as Atari to introduce similar products and by 1976 the video game console market was worth over $240 million per year in the US alone. The market has continued to grow at an astounding rate and is now worth an estimated $49 billion per year in worldwide sales. Ralph Baer’s invention was the first successful hardware implementation of an interactive video game and his contribution to the birth of an industry was recognised by his adopted country in 2004 when he was awarded the US National Medal of Technology. Of course, you no longer have to buy a dedicated game console in order to play interactive video games. Most popular console games are also available as software versions which can be installed and run on a standard personal computer (providing that it meets the minimum hardware specification required by the game itself). In conducting the research for my book, I was amazed to discover that the earliest known example of such a game predates the early video game consoles of the 1970s by more than 20 years. It was a bouncing ball simulation written in 1950 for the MIT Whirlwind computer by Charles W Adams and John T Gilmore, two of the eight programmers on the Whirlwind development team. Adams and Gilmore created a program that employed three differential equations to calculate the trajectory of a bouncing ball and display it on the computer’s oscilloscope screen. By adjusting the bounce frequency using a control knob, the ball could be made to pass through a gap as if it had gone down a hole in the floor. This was not the only notable achievement of the MIT Whirlwind project. The machine itself is one of the most significant of the first generation of stored-program computers. 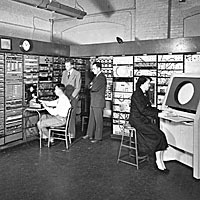 It provided a platform for MIT’s contribution to the development of magnetic core memory, a revolutionary type of memory technology which transformed the speed and reliability of early electronic computers. More importantly, it is also the source of virtually all of the earliest developments in computer graphics and its design was later adopted by the US Air Force for the largest computer system ever built, the Project SAGE (Semi-Automatic Ground Environment) air defence system. This entry was posted in Uncategorized and tagged computer graphics, video games, Whirlwind on 20/01/2015 by Stephen J Marshall.